How can I import CSV files as shapefiles in R? Import .csv files containing x,y coordinate locations into R as a data frame. Convert a data frame to a spatial object. Export a spatial object to a text file. This episode will review how to import spatial points stored in .csv (Comma Separated Value) format into R as an sf spatial object. We will also reproject data imported from a shapefile format, export this data as a shapefile, and plot raster and vector data as layers in the same plot. Create a map of these plot locations. Export the data in a shapefile format to share with our colleagues. This shapefile can be imported into any GIS software. Create a map showing vegetation height with plot locations layered on top. Spatial data are sometimes stored in a text file format (.txt or .csv). If the text file has an associated x and y location column, then we can convert it into an sf spatial object. The sf object allows us to store both the x,y values that represent the coordinate location of each point and the associated attribute data - or columns describing each feature in the spatial object. We will continue using the sf and raster packages in this episode. Let’s check out the column names of our dataframe. "easting"    "northing"   "geodeticDa" "utmZone"    "plotID"
 "stateProvi" "county"     "domainName" "domainID"   "siteID"
 "plotType"   "subtype"    "plotSize"   "elevation"  "soilTypeOr"
Our column names include several fields that might contain spatial information. 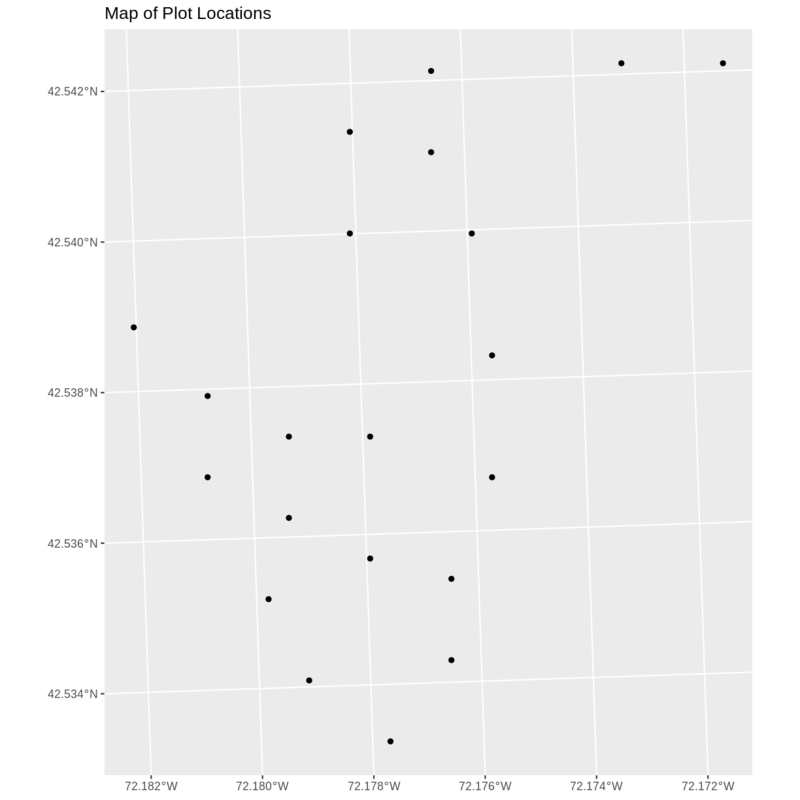 The plot_locations_HARV$easting and plot_locations_HARV$northing columns contain coordinate values. We can confirm this by looking at the first six rows of our data. We have coordinate values in our data frame. In order to convert our data frame to an sf object, we also need to know the CRS associated with those coordinate values. There are several ways to figure out the CRS of spatial data in text format. We can check the file metadata in hopes that the CRS was recorded in the data. We can explore the file itself to see if CRS information is embedded in the file header or somewhere in the data columns. Following the easting and northing columns, there is a geodeticDa and a utmZone column. These appear to contain CRS information (datum and projection). Let’s view those next. In When Vector Data Don’t Line Up - Handling Spatial Projection & CRS in R we learned about the components of a proj4 string. We have everything we need to assign a CRS to our data frame. To create the proj4 associated with UTM Zone 18 WGS84 we can look up the projection on the Spatial Reference website, which contains a list of CRS formats for each projection. From here, we can extract the proj4 string for UTM Zone 18N WGS84. However, if we have other data in the UTM Zone 18N projection, it’s much easier to use the st_crs() function to extract the CRS in proj4 format from that object and assign it to our new spatial object. We’ve seen this CRS before with our Harvard Forest study site (point_HARV). The output above shows that the points shapefile is in UTM zone 18N. We can thus use the CRS from that spatial object to convert our non-spatial dataframe into an sf object. Next, let’s create a crs object that we can use to define the CRS of our sf object when we create it. The CRS that the column coordinate represent (units are included in the CRS) - stored in our utmCRS object. We will use the st_as_sf() function to perform the conversion. We should double check the CRS to make sure it is correct. We now have a spatial R object, we can plot our newly created spatial object. In Open and Plot Shapefiles in R we learned about spatial object extent. When we plot several spatial layers in R using ggplot, all of the layers of the plot are considered in setting the boundaries of the plot. 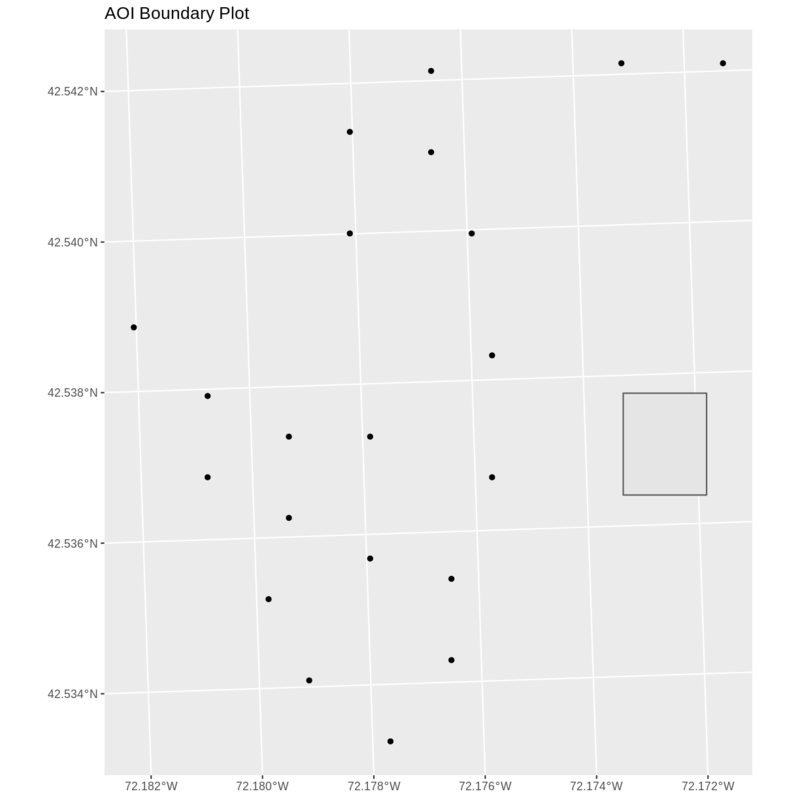 To show this, let’s plot our aoi_boundary_HARV object with our vegetation plots. When we plot the two layers together, ggplot sets the plot boundaries so that they are large enough to include all of the data included in all of the layers. That’s really handy! 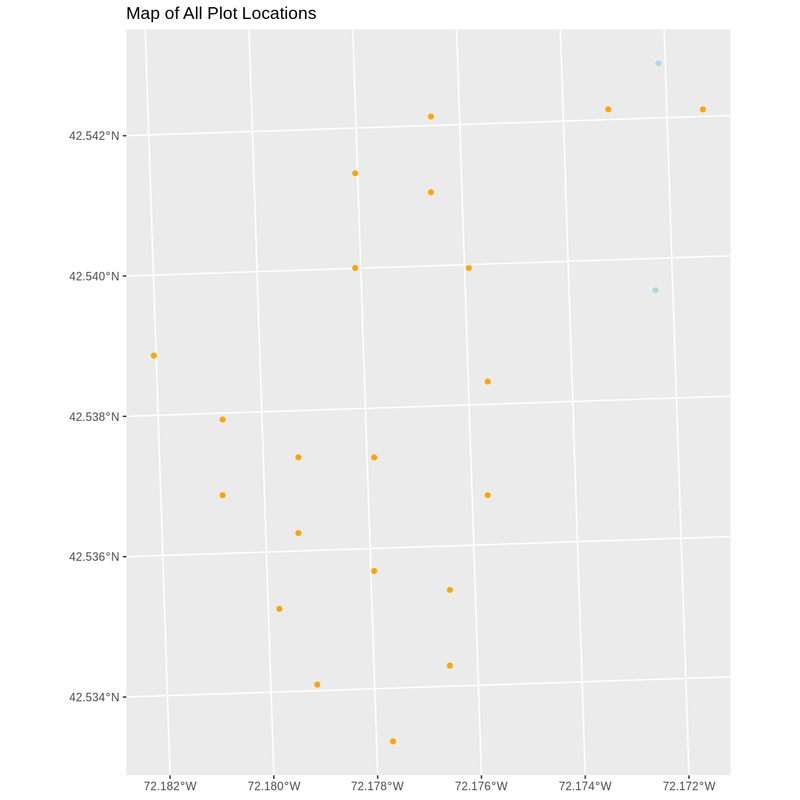 We want to add two phenology plots to our existing map of vegetation plot locations. Find the X and Y coordinate locations. Which value is X and which value is Y? These data were collected in a geographic coordinate system (WGS84). Convert the dataframe into an sf object. Plot the new points with the plot location points from above. Be sure to add a legend. Use a different symbol for the 2 new points! If you have extra time, feel free to add roads and other layers to your map! 1) First we will read in the new csv file and look at the data structure. 2) The US boundary data we worked with previously is in a geographic WGS84 CRS. We can use that data to establish a CRS for this data. First we will extract the CRS from the country_boundary_US object and confirm that it is WGS84. Then we will convert our new data to a spatial dataframe, using the geogCRS object as our CRS. Next we’ll confirm that the CRS for our new object is correct. We will be adding these new data points to the plot we created before. The data for the earlier plot was in UTM. Since we’re using ggplot, it will reproject the data for us. 3) Now we can create our plot. We can now export the spatial object as a shapefile.